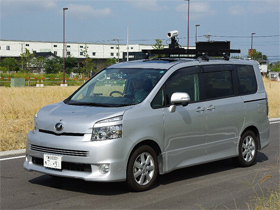 The ROMEN CATCHER VP (Level change and road surface imaging acquisition system) was developed with the aim of supporting complaint responses and inspection patrols. 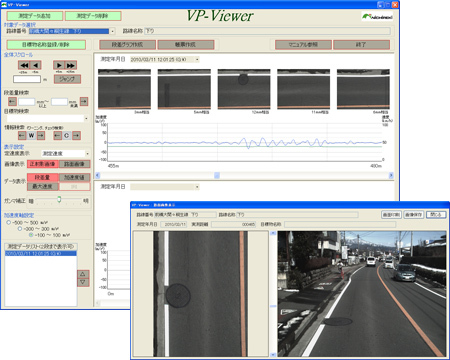 The road surface and roadside images and the acceleration waveform are gathered as distance-coordinated data, and viewing, searching, and tabulation can be carried out using the VP-Viewer (dedicated software). The up-down vibration of vehicles caused by bridge joints and construction implementation joints creates unevenness or steps (changes in level) of the road surface which result in complaints regarding road paving. In this system, acceleration gauges are used to gather the vibration, and calculation is made of the equivalent level change amounts. Although surveys using acceleration gauges normally require measurement to be carried out at fixed speeds, the ROMEN CATCHER VP is able to capture the size of the level changes while travelling in a range between 20-60km/h. By enabling consecutive level change measurement to be carried out, this system targets a wide range of areas by carrying out low cost inspections of positions which generate large vehicle vibration, such as defects in the roughness of the road paving.